This illustrious saint was born at Harpham, a village in the province of the Deiri, which comprised Yorkshire, Lancashire, and the rest of the kingdom of the Northumbers, on the south side of the Tyne; what lay beyond it being called Bernicia. An earnest desire of qualifying himself for the service of God drew him young into Kent, where he made great progress in learning and piety, in the famous school of St. Theodorus, the archbishop, under the direction of the holy abbot Adrian. Afterwards returning into his own country, he pursued the exercises of piety in the monastery of men under St. Hilda at Whithy; till in the beginning of the reign of king Alfred, upon the death of Eata, he was made bishop of Hagulstad, or Hexam. What time he had to spare from his functions he consecrated to heavenly contemplation; retiring for that purpose into the churchyard of St. Michael's, beyond the river Tyne, about a mile and a half from Hagulstad, especially during the forty days of Lent. He was accustomed to take with him some poor person, whom he served during that time. Once in the beginning of a Lent, he took with him a dumb youth, who never had been able to utter one word, and whose head was covered with hideous scabs and scales, without any hair. The saint caused a mansion to be built for this sick youth within his enclosure, and often admitted him into his own cell. On the second Sunday he made the sign of the cross upon his tongue, and loosed it. Then. he taught him to say <Gea>, which signifies in Saxon <Yea>, or <Yes>; then the letters of the alphabet, A, B, C, and afterwards syllables and words. Thus the youth miraculously obtained his speech. Moreover, by the saint's blessing the remedies prescribed by a physician whom he employed, his head was entirely healed, and became covered with hair. When St. Wilfred returned from banishment, St. John yielded up to him the see of Hagulstad: but some time after, upon the death of Bosa, a man of great sanctity and humility, as Bede testifies, he was placed in the archiepiscopal chair of York. Venerable Bede, who received the holy orders of deacon and priest at his hands, gives ample testimony to his sanctity; and relates the instantaneous cure of the sick wife of a neighboring thane or lord, by holy water, and several other miracles performed by him, from the testimony of Bercthun, abbot of Beverley, and Herebald, abbot of Tinmouth, who had been eye-witnesses to several of them. St. John made frequent retirement his delight, to renew thereby his spirit of devotion, lest the dissipation of exterior employs should extinguish it. He chose for his retreat a monastery which he had built at Beverley, then a forest, now a market-town, twenty-seven miles from York. This monastery, according to the custom of those times, he erected for the use of both sexes, and put it under the government of his disciple, Bercthun, or Brithun, first abbot of Beverley, then called Endeirwood, or wood of the Deiri. 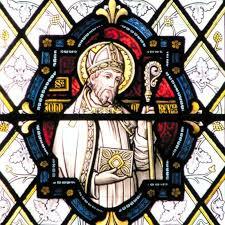 In 717, being much broken with age and fatigues, he resigned his bishopric to his chaplain, St. Wilfrid the, younger, and having ordained him bishop of York, he retired to Beverley, where he spent the remaining four years of his life in the punctual performance of all monastic duties. He died there the death of the just, on the 7th of May, 721. His successor governed the see of York fifteen years, was a great lover of the beauty of God's house and is named among the saints, April the 29th. The monastery of Beverley having been destroyed by the Danes, king Athelstan, who had obtained a great victory over the Scots by the intercession of St. John, founded in his honor, in the same place, a rich collegiate church of canons. King Henry V. attributed to the intercession of this saint the glorious victory of Agincourt, on which occasion a synod, in 1416, ordered his festival to be solemnly kept over all England. Henschenius the Bollandist, in the second tome of May, has published four books of the miracles wrought at the relics of Saint John of Beverley, written by eye-witnesses. His sacred bones were honorably translated into the church by Alfric, archbishop of York, in 1037: a feast in honor of which translation was kept at York on the 25th of October.